I am saddened that one of my favorite TV shows in recent years — "The People v. O.J. Simpson: American Crime Story" — will have its final episode on Tuesday. "The People v. O.J." is a 10-show series that reenacts O.J. Simpson's double-murder trial, AKA the "Trial of the Century," that took place from January to October 1995. 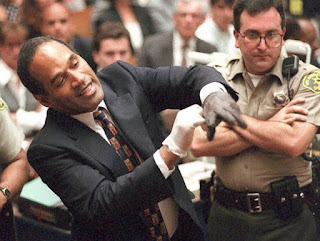 Because this happened more than 20 years ago, I find it an excellent time to reevaluate what happened with O.J. and see if we still have the same feelings and ideas we did 20 years ago. I personally look at the O.J. Simpson double-murder trial much different through the lens of 20 years later and the perspective of "The People v. O.J." Twenty years ago, my view — the white view — was that there was overwhelming scientific, practical, circumstantial and common sense evidence that proved O.J. Simpson murdered his ex-wife Nicole Brown Simpson and Ron Goldman. Today, I remain certain that O.J. murdered Nicole and Ron Goldman, but the trial indeed was much more than a creative defense of the former Heisman Trophy winner. The Trial of the Century, and the racial message from the defense, was ahead its time. Now, I see the O.J. Simpson trial as a loud message to white people to see the different America that blacks live in. It is a loud message that some whites should have realized in the past 20 years or before then, but many remain blind to. Twenty years ago, I thought "playing the race card" was inappropriate for the horrific crimes that O.J. committed. I saw that as a smoke-and-mirrors defense, a Chewbacca defense, that was beside the point of the murders that happened on June 12, 1994. But now, after taking a 20-year break from this trial, I believe that the racial messages from O.J. 's defense team were relevant then and relevant now. With sincere respect to the families of Nicole and Ron, those messages may actually be bigger than their murders. The trial itself was bigger than the murders. Back when the verdict was read on Oct. 3, 1995 and O.J. was acquitted, my response was immediate cynicism for the justice system. I heard and even said things like, "Money will let you get away with murder, and that's the bottom line." I even blamed the jury for being clouded by emotion and race. The jury that acquitted O.J. was comprised of nine blacks, two whites and one Latino. In their eyes, and those of magistrate maestro Johnnie Cochrane, they preferred the narrative of how blacks have been persecuted throughout U.S. history and O.J. was a part of that. Of course, O.J. did not stay closely connected to the black community. The defense team switched out his pictures and decor when the jury visited his home to make it "more black." And he severely beat Nicole previously to the point where, according to police records, she told police, "He is going to kill me. He is going to kill me. You never do anything to him. You talk to him and then leave." Today, O.J. is serving a 33-year sentence in Nevada for multiple felonies, including armed robbery and kidnapping. He will be eligible for parole next year. To say that the United States is a violent culture is an understatement. The United States is averaging more than one mass shooting per day (four or more shot at a single location), and the U.S. military budget is $581 trillion compared to second place China's $155 trillion. Perhaps it makes perfect sense that three single events in the past 53 years that are likely the most memorable to the U.S. population are JFK's assassination, 9/11 and O.J. 's murder trial.